Apollo Bay to Johanna (57km). Spend two nights in some great camping spots. We'll transfer your camping gear, food, bags & provide drinking water (no drinking water available on the track). You finish at Johanna Beach on day three. We return you back to Apollo Bay. Food. You purchase your food before you arrive, or in Apollo Bay on your arrival. Apollo Bay has 2 supermarkets and a fruit & vegetable store. On the first day of your walk, you leave your food (for the duration of your whole walk) in our trailer. 1) 1) Check that there is availability for this package first by checking dates on our booking button..
Leave large rucksacks for collection (by 9 am) in the trailer at Aire River. You walk to Johanna Beach. You collect rucksacks from the trailer at Johanna Beach in the afternoon. 1pm transfer back to Apollo Bay. (ETA 2pm). 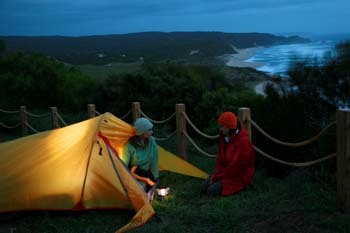 We strongly suggest you buy an Official Great Ocean Walk Map if you have not already purchased one. You are able to buy a map from us at an additional cost for $15 and you collect on arrival. (This price does not include postage). Please also note that if you arrive early at the meeting spot on your last day you must wait for your pick up / transfer as times advertised. If you are fast walkers, pace your last day's walk. Enjoy your campsite in the morning before you set off on your walk to avoid waiting times.